As this season moves closer to completion, Hitman tries something a bit different. What is it? The fifth Hitman level, this one set on a farm full of bastards. The trouble with reviewing each individual Hitman level—and I'm definitely not saying this entire endeavour has been a waste of time—is that so much of what makes Hitman good happens in its systems. The levels are important, particularly in regards to the guard placement, disguise flow and creative opportunities. But all, so far, have been variations on the same theme. That it works is because, at its core, Hitman's stealth and AI manipulation systems are satisfying. Episode 5's new level departs from the template set over the past four episodes. And yet, this is still a competently constructed space in which to cleanly and creatively kill some people. It's good, because, like past episodes, it's attached to a good game. What makes this new mission, Freedom Fighters, different, is that 47 is operating in hostile territory. Previous episodes, much like Blood Money before them, feature an area of public space to explore, giving the player chance to watch, learn and plan. Here, 47 is infiltrating a Colorado farm occupied by a patchwork militia of hackers, explosive experts and assassins. If you're spotted, you're in trouble. In that sense, Episode 5 features a style of challenge reminiscent of Hitman 2: Silent Assassin. The shift places a bigger emphasis on sneaking, at least up to the point of securing your disguise. Still, while Colorado eventually morphs into a more familiar style, the change in atmosphere keeps things feeling fresh. We've infiltrated a lot of mansions in Hitman up to now. It's nice to try something a bit different. Episode 5 features a style of challenge reminiscent of Hitman 2: Silent Assassin. This episode also brings stronger ties to the overarching story that, up until now, has been told almost exclusively in the cutscenes that play after each mission. It's still just a small part of the level, but, ultimately, that's all it can be. Because of Hitman's release model, each mission must stand alone to preserve its replayability over the life of an episode. The farm is broken up into distinct sections, some with specific restrictions on who is allowed inside. A basic grunt can't enter the patch of land used for creating and testing explosives, and the main house is off limits to all but the elite guards. Freedom Fighters features four targets, each doing their own thing in a separate part of the compound. The structure creates lots of small-scale stealth challenges, reinforcing the hostile theme. Normally, I prefer the more open, public levels. But Hitman needed to mix up its formula, and Colorado does the job. In terms of murder methods, it's a little less interesting than previous episodes – only a few Opportunities exist spread over all four targets. But there's plenty to try, and the layout of the farm, and the nature of its restrictions, opens up the possibility for a satisfying series of contracts, escalations and elusive targets. Colorado isn't the most visually appealing or intricate level in Hitman. 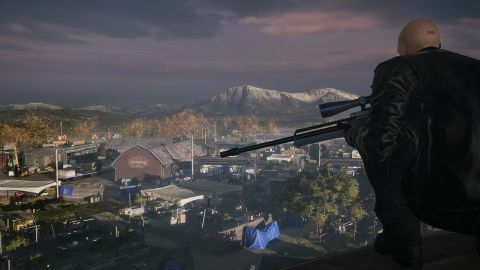 But it provides some much needed variety—a change of scenery and challenge that rounds out the Hitman experience. It feels as if IO has spent most of this season demonstrating that it can still get Hitman right. It's nice to see they're now confident enough to move away from the template they've created.